From this page you can send us a message and find all of our contact details. If you scroll down the page you can also find out more about our Abingdon branch and its history. Tonks Funeral Directors Abingdon office is based in Abingdon on Thames, the historic market town set in rural Oxfordshire. With its ancient streets, riverside walks and annual festivals Abingdon proudly claims to be the oldest town in the country. Whilst a traditional funeral is still the most common service we provide, we have to move with the times, it is a sad fact that sometimes people die younger and that their funeral requirements will be completely different, even the older amongst us may want something different. As a family run Independent Funeral Director serving families in Abingdon and surrounding areas we believe we are here very much for the living and their needs, our responsibility is to work with those left behind, to provide create what is most often a celebration of someone’s life. 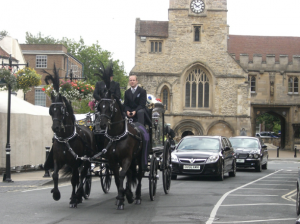 The service may include provision of an environmentally friendly coffin, willow, cardboard or pine through to the highest quality wood or possibly an alternative form of transport, be it a horse and carriage or a motor-cycle hearse or one of the many other options that we have available. On our website you can find details of our service including details of how to register a death. We operate a fine fleet of luxury vehicles, work with the best tradesmen available for fine memorials and offer beautiful floral arrangements in accordance with your wishes. A less traditional but increasingly popular service is the facility to make online donations. Should you wish to research or set up a pre-payment funeral plan you may do so on our website or contact us for more information.